Set against 4 rugged mountain ranges back dropped by big blue skies, Tucson offers a wide variety of Tucson luxury home communities, each offering unique scenery. North Tucson is located at the base of the Catalina Mountains, surrounded by the natural desert, many of the single family ranch style homes are situated on acreage in gated communities. 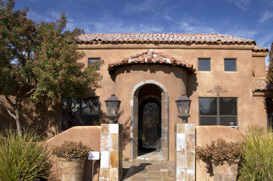 Most of the Tucson luxury homes are concentrated in this area, with exclusive estates embracing the Old World Hacienda charm with Tuscan accents, Joesler with natural contours and desert vegetation, Contemporary architecture magnificently appointed, surrounded by the pristine high Sonoran Desert to the Tucson luxury golf courses. El Encanto is a part of the National Registrar of Historical places, the document called ” Nomination of El Encanto Estates Residential Historic District” contains s very impressive journal about the history of El Encanto. In this Tucson historical journal you will find the history of its resident and architectural plans. El encanto was founded in 1928 and was home to Tucson’s most prominent residents. Many of the Tucson residences were built by such architects as M.H. Starkweather, Hendrick Olsen Jaastad, Josias Joesler, Arthur Thomas Brown, and Anne J. Rysdale. There are other historical areas in Central Tucson with residential homes for sale such as Sam Hughes, Blenman, Barrio, and the Ice lofts. Tucson foothills was just being discovered for its Sonoran Desert flora and fauna. A famous builder named, John Murphy started to buy up land and develop the Catalina Foothills area of North Tucson. In the 1920’s the Tucson Foothills was considered to be rural property. Murphy had the vision of developing 10 subdivisions with 3 or more acres. The preservation of the sonoran desert was important to him so he planned to have each lot consist of 3 aces. He acquired 7,000 acres but before he could put his plan in place the stock market crashed and he was forced to sell his acreage for $10.00 and acre. Josias Joesler was a friend of Murphy’s and together they developed the Catalina Foothills Estates. Exclusive gated communities with residential homes for sale are: Alta Vista, Ventana Canyon, La Paloma, Pima Canyon, Skyline Country Club, Alta Vista, Rio Verde Vista, Cimmaron, and Shadow Hills Estates. It is at the corner of River & Campbell the famous Spanish Colonial Style architecture still stands, “St. Phillips in the Hills Episcopal Church and Joesler’s studio which is a fine art gallery today. The Catalina Foothills offers some of the most exquisite boutiques, renowned restaurants, and scenery that makes Tucson so unique. There is always something to do and see in the Tucson Catalina Foothills. Oro Valley is experiencing “growth”, as a new luxury residential and commercial development. Investment savvy buyers are snapping up property here, with expectations of future growth. The locals understand that Oro Valley affords some of the most spectacular Catalina Mountian and Tortolita Mountain views on the Tucson Valley. Since the 1980’s, Oro Valley has experienced significant residential and commercial growth. Oro Valley has become a place for second, third, and fourth home owners to call home. Oro Valley is considered an affluent area of Tucson and is known for its golf communities, resorts, and country clubs. Some of the exclusive gatged communities is Oro Valley are Stone Canyon Golf, Canada Hills Estates, High Mesa Estates, Carmel Pointe, Vistoso At the the Green, Honey Bee Ridge, La Reserve, Oro Valley Country Club, Naranja Ranch Estates, and Pusch Ridge Estates. With a decidedly equestrian family orientated environment surrounded by National Forest. The area is known for its drive to Mt. Lemmon and home to the famous Sabino Canyon. Many of the residential homes in Northeast Tucson are situated on 1 acres lots with equestrian privileges. The Tanque Verde Loop area consists of a grove of Mesquite trees and gentle rolling hills. The Tanque Verde School district has won many awards.